GUNTERSVILLE, Ala. -- There is a lovely young couple with a 1-year-old daughter living in a brand new home within view of Guntersville Lake. Each room, each brick on the exterior façade, each door and window, and, indeed, everything about this new home was a gift from a community of patriots who came together to build it as a way to say "thank you" to a locally grown hero who went to war for his country and, in so doing, lost both legs below the knees. He also lost his left pinky finger, most of the use of his left hand, and suffered from damage to his left eye, and minor traumatic brain injury and post traumatic stress disorder. This new home -- along with their lives together as a family and their hopes for the future -- represents a "happily ever after" for Corey and Megan Garmon, and their daughter Kyleigh. With the help and generosity of family, friends and even strangers, and donations from community organizations and private companies, they have picked up the pieces of their shattered dreams and built a new life together in Guntersville. "This makes me feel normal," Garmon said, sitting in the spacious family room of his new home. "It represents many things to me. This is a place where I can relax. We haven't had something like this in so long. It's our home and, to me, it's independence." And it's a long way from July 11, 2012, when Corey Garmon, an Army cavalry specialist, became the first Soldier in his platoon in Afghanistan to be hit by an improvised explosive device. 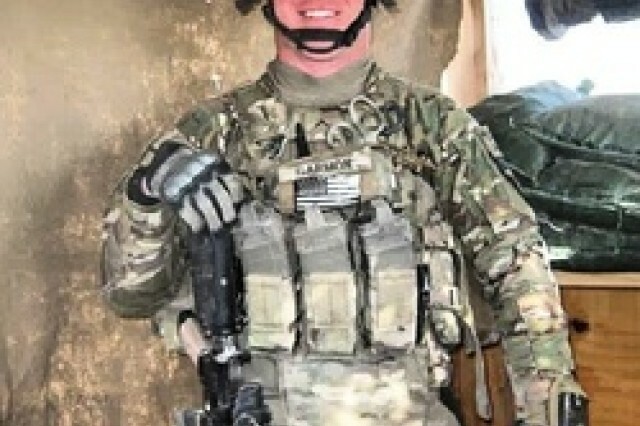 He sustained his injuries during the dangerous "Fighting Season" when insurgents come from other countries into Afghanistan to help farm drug crops and fight "non-believers." Garmon and his platoon was on a mission to recover the body of a dead insurgent in Kandahar when his platoon was ambushed by the enemy and Garmon stepped on an IED in an area that had previously been declared IED-free by a mine detector specialist. "We'd been there eight months and, as a platoon, we were perfect. We hadn't had any injuries, no deaths, just perfect. Then I got hit and me laying there put them all in trouble," Garmon remembers. "My platoon sergeant said he can hear it every day. He has said, 'When Corey was lying there all he could do was apologize over and over again.' I was telling them I was sorry for getting hurt. My platoon sergeant told me to not ever apologize again for what happened. He said, 'The way I see it, you're a damn hero.'" And that's the way the Guntersville community sees it, too. 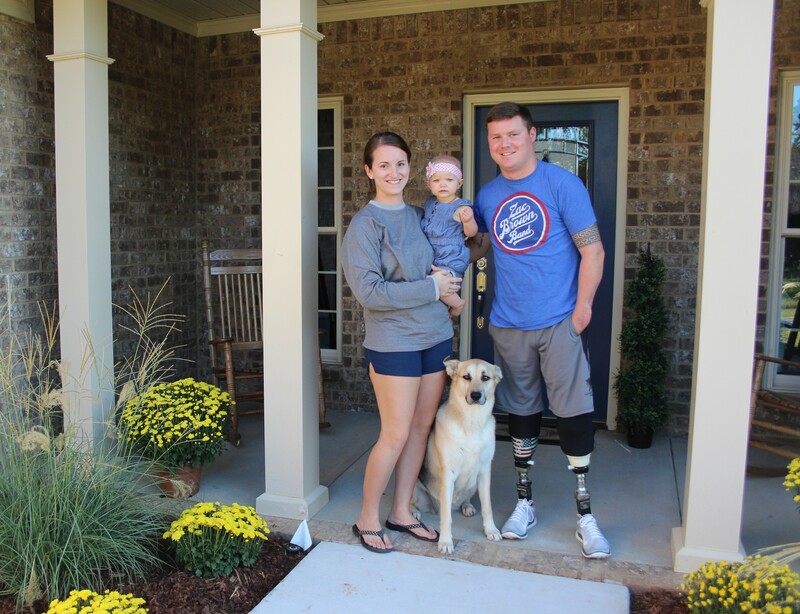 Garmon is their hometown hero come home, an Alabama born and bred wounded warrior who's very will to continue to live his life despite his injuries makes him a symbol of hope for everyone who meets him. "I don't feel like a hero," he said. "Any guy who was with me on that day when I got hit, is just as much of a hero, if not more. They're the ones who got me off the field." Four days after the explosion, Garmon woke up at Walter Reed Medical Center surrounded by his family and his girlfriend, Megan. He stayed in the hospital until September 2012 and then was moved to the hospital's Wounded Warrior apartments, where he lived for more than a year as he recovered from his temporary injuries and learned to live with the permanent ones with the help of the doctors, nurses and therapists of Walter Reed's Wounded Warrior Inpatient Care Unit. "The care there was the best. They were the most caring doctors and nurses ever. They were very personable and they all helped me a lot," Garmon said. It was while being cared for in those early days of his injury that Garmon realized there was a community of patriots back in Guntersville who were cheering and praying him on to recovery. "It was one of those days when I was down and out," he recalled. "My mom started talking to me about all the people who wanted to help me and about the organizations that were doing things for wounded warriors and their families, things like building them a house and helping them get back to life." But that was not a priority for Garmon at the time. Instead, he focused on getting back the life he so much wanted. He had about 60 surgeries, many to clean the shrapnel out of his body and others to build a good nub so that his leg stumps could accept prosthesis. He spent a good bit of time with psychiatrists, learning to work through PTSD issues and concerns related to his new disabilities. He spent a lot of time in rehabilitation and physical therapy, growing the muscles he would need to stand, walk and, someday, run on his new prosthetic legs. "It's a lot different for people who are born without legs, and who wear prosthesis from a young age," he said. "When you lose a leg from a traumatic injury, you have to get your muscles tightened up to accept the prosthesis. At first, they let me walk in my prosthetics for 10 steps and then they took them away. They made me work for them. I had to do a lot of stuff on a mat, with core stretching and building strength, before I could have my legs back. It takes a lot of strength to work these legs." On Sept. 25, 2012, Garmon started walking with his prosthesis. In late November 2012, Garmon went home for the first time. "The welcome I received was incredible," he said. "There were people lined up on both sides of the road from Huntsville all the way to where my parents lived in Sardis City. That experience was truly amazing. It made me realize why I was able to endure all the struggles from my deployment to injury and through recovery. I was able to endure it because of this great nation we live in." Garmon and wife Megan married in February 2013, and with that marriage and the coming of their baby in September, thoughts turned to how and where they would live. Garmon and his family joined up with a nonprofit group in New York City that could help make the dream of a new home a reality for the wounded warrior. In July 2013, the Boaz VFW kicked off fundraising efforts for the Garmon couple's new home. "Everything kind of took off really fast. From the beginning, we had six or seven businesses donating carpentry work, roofing, concrete, bricks and all the landscaping," Garmon said. "Megan and I went back to Walter Reed after the kickoff. But in addition to physical therapy, we were spending a lot of time looking at floor plans." But the floor plans offered to them by the nonprofit fundraising group were not the kind that would work for Garmon. They called for things like exterior siding, which Garmon did not want because of the maintenance it would require; long hallways, which can be hard for Garmon to maneuver; and a basic floor plan that did not provide the accessibility and amenities needed by a wheelchair-bound resident. "I'm in my legs most of the time," Garmon said. "But if you had asked me five years ago if I would be wearing prosthesis, I would have said, 'No!' I don't know how things will be for me five years from now. But I want to make sure to have wheelchair access in case I do need it someday." After six months of trying to work through such issues, the nonprofit told Garmon, "they were not in business to build custom homes for wounded warriors. Everybody is different and this just didn't work out for us." So, they parted ways, with the donations made to the Garmon home going into a special fund for its construction. With ties severed, Garmon became his own fundraising entity. "All the businesses that committed to making donations for things like roofing, bricks, flooring, furniture … I met with every single one of them and every single one had the same response. They did not pledge to a 501c3. They made their pledge to Corey Garmon and they were sticking by it," Garmon said. "We did lose some financial pledges from individuals. People get emotionally attached and say things they don't mean. But for everyone that backed out of their pledge, two others would step in." Construction on the 2,700-square-foot home began in the spring after a groundbreaking in March. One of the most important donors to the project was Keith Hulsey of Hulsey Construction of Albertville, who gave countless hours from his construction crew to work on the home, often alongside Garmon family members and friends. "My family worked every day this past summer doing a lot of cleaning up, painting, caulking and things like that. My dad and brother Kyle did a lot of the electrical work," Garmon said. "We've had a lot of help." 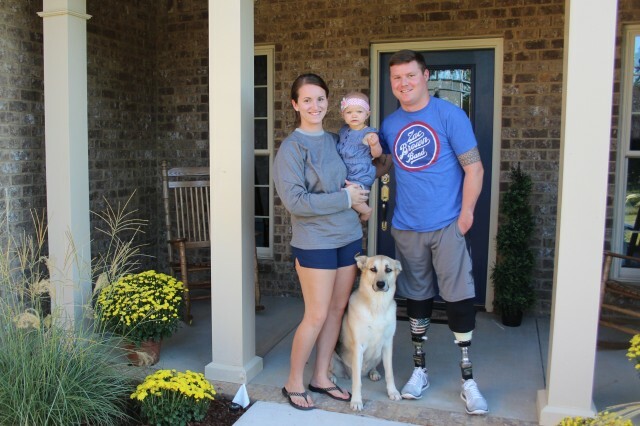 Garmon was released from Walter Reed on April 25, and he and Megan and Kyleigh lived with his parents through the summer until they moved into their new home in September. In addition to accepting donations of any kind, the Garmon family coordinated a flag fundraiser where American flags were flown on the Garmon home site and then delivered with a plaque to those who paid $30 a flag. Enough funds and donations were raised to help to pay for about 50 percent of the home. The Garmon couple still have a construction loan they hope to pay off with a Veterans Affairs grant in the near future. "We want to have no mortgage or a minimal mortgage," Garmon said. "Being injured and not knowing the future, it's nice to not have to worry about where my family is going to live." Garmon, who medically retired from the Army in June as a sergeant, has also started a commercial construction company, Garmon Smith LLC of Albertville, with a fellow business associate. The company is focused on the military government building business, and has applied for a service-disabled veteran-owned small business certificate, he said. "The VA is being much more careful about issuing certificates because they don't want a business built up around a disabled veteran who doesn't qualify to run the business and they don't want a business built up in the name of a disabled veteran only to have that veteran kicked out once the certificate is received," Garmon said. "Right now I don't have the experience in the construction field. So, it will take about a year for me to get that and then we will be able to get the certification. But it also takes a great leader to run a business, and I received the best leadership training you can get from the Army." Just as when he committed to being a Soldier in March 2011, Garmon is now committed to make a good life for his family despite his injuries. He is thankful for Army benefits, including his disability payments and his Tricare for life insurance. He is thankful for the family and friends -- both in Guntersville and in the Army -- who saw him through the darkest days of his recovery and who are always there for him when he is in need. 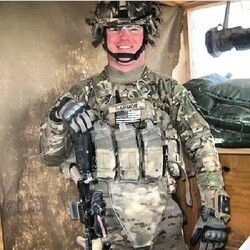 And he's thankful for the home the community built for their hero come home. "We are blessed. We are very, very blessed," he said as he stands with his wife and daughter in front of their home near a flag pole with the U.S. flag gently whipping in the wind.